This deck looks like a well oiled machine! 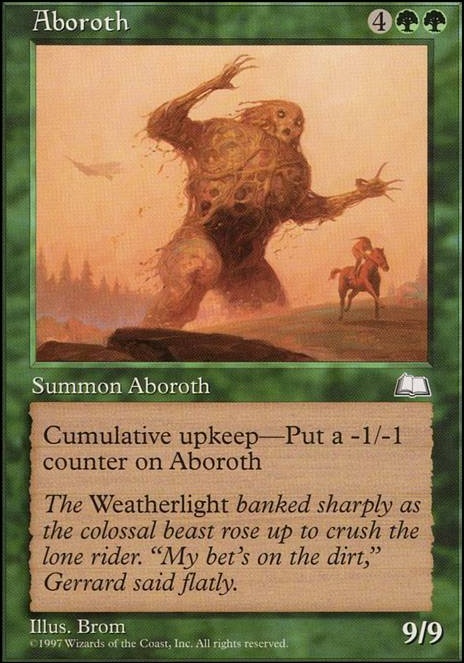 Might not be good enough but some old cards that are on theme would be Aboroth and Harbinger of Night. Thanks KingofCorns, I'm glad you like the deck. The discard is an interesting idea that I'll have to give some thought. Currently, I figured Evoke could fill that role, as most elementals have it. Hi! I'm very interested in this deck and will definitely be keeping an eye on it. Found myself a Horde of Notions the other day and I want to try out some jankyness just like this, I'm already a big fan of cards like Animar, Soul of Elements, Forgotten Ancient and Phytotitan. I'll be keen to see how you bring the price down. 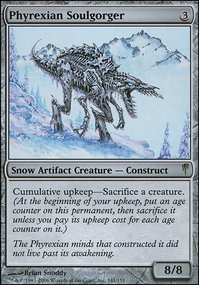 Have you considered any cards that may enable you to discard larger creature cards early on? Geier Reach Sanitarium + Faithless Looting, etc.? I like the look of Aboroth, could he work in here.? Very cool deck WickedLizardInc! A decent $25 deck is a great accomplishment! Moreover, a lot of the stuff in here looks genuinely strong, and not jank at all. On the subject of evasion, Trailblazer's Boots is other inexpensive equipment that gives nearly unblockable and doesn't have Hot Soup's downside, though it doesn't curve with Hapatra quite as well. Reclamation Sage is a bit cheaper than Beast Within and you may be able to count on your -1/-1 counters to take out troublesome creatures, and your snakes to combat planeswalkers. Unravel the Aether and Deglamer maintain instant speed and budget while dealing with indestructibles like the Theros gods, Blightsteel, etc. Speaking of removing creatures, fight works great with deathtouch snakes as well as infect/wither. I see you already have Ulvenwald Tracker, but how about Setessan Tactics for some instant speed blowouts? I feel like Liliana's Influence is a little weak for its mana cost and it's over twice as expensive as the average card. Corrosive Mentor can spread a lot of -1/-1 counters at half the mana cost. 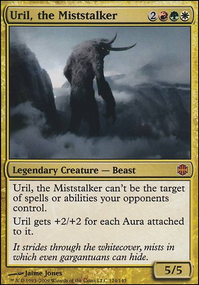 Rendclaw Trow is another 3 mana witherer that also has persist! Blight Sickle allows everyone, including the snakes, to get in on the fun. Eldritch Evolution is even more expensive, and doesn't have many targets from your snakes. The exact effect is impossible to replicate as thriftily, but Primal Command give the tutor effect along with other decent modes for about 80 cents less (you can find it for about $1 quite easily). Gravity Well is an interesting one. I wouldn't want to stop my opponent's flyers from attacking each other though, just me. Tower Defense does the same job for a turn, and the toughness boost is considerable. It's enough to use it against ground attackers to keep all your blockers alive. Blightwidow and Deadly Recluse are the spiders that seem to fit best. Windstorm and Whirlwind proactively handle flyers. 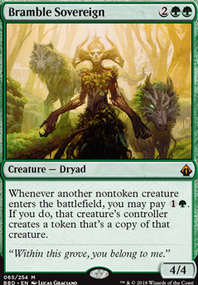 Jungle Hollow is as about cheap as Foul Orchard, as is Golgari Guildgate. Grim Backwoods generates some value from excess snakes. I find the one mana cycle lands good to mitigate land flood, and they're less than $0.25 too. Oran-Rief, the Vastwood would require one of the more expensive spells to leave, but it's far better than a basic Forest. Some ramp wouldn't go amiss. Wayfarer's Bauble, Rampant Growth, and Nissa's Pilgrimage are super budget. Sakura-Tribe Elder is 0.75, but snake flavor! Grapple with the Past is flexible. Card draw options: Warriors' Lesson, Altar's Reap, Mask of Memory, and Vulturous Aven make use of your snakes. Read the Bones is rarely bad. For graveyard based card advantage, there's Phyrexian Reclamation and Wildest Dreams. Skullwinder is political and thematic. Creeping Renaissance could potentially replace Seasons Past at a lower price. What else could come out? Probably Aboroth, it doesn't do as much as any other 6+ mana spell in the deck I think, or even the 5 mana spells. It doesn't even provide -1/-1 counters until your next upkeep. Hideous Visage feels like it's not necessary, since who's blocking 1/1 deathtouch creatures anyway? 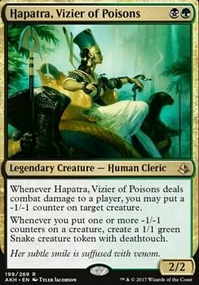 It's true that Hapatra wants evasion, but intimidate isn't even great on a two color creature; Aphotic Wisps does the job for one mana, and cantrips. Likewise, Sewers of Estark is too much mana and too many cents for the effect. 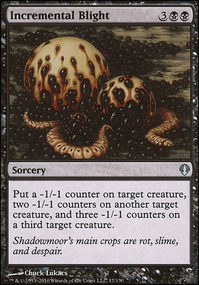 Culling the Weak seems like something that belongs in an explosive combo deck, not a grindy, incremental value deck. Well that's it, I look forward to seeing you evolve this deck! I recently built my own version of this deck, and gladly took a couple ideas from this build (I didn't even know Power Conduit was a card, actually). I have a couple suggestions from my build, as well. First is Aboroth. If you can get your hands on one, especially with Melira. Makes it a really cheap 9/9. Second would be Lifeline, again if you can get your hands on one. That one is a personal choice, however, since it does work for everyone, but hey, more things for you to put counters on, right?